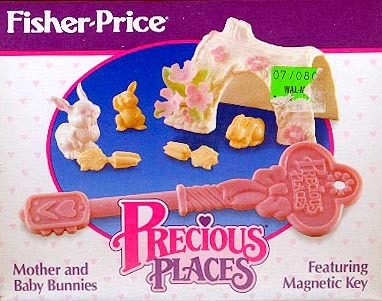 Description: This set includes a Precious Places® mother rabbit and two baby bunnies. The set also includes a small hollowed tree trunk for them to sleep in, and 2 carrots for them to eat. Designed for children ages 5 years and older. FPT7407 - Precious Places® white mama rabbit figure that is standing on her back legs. She has pink inner ears, pink dot eyes, and a small round magnet on the bottom. FPT7408 - Precious Places® pink baby bunny figure that is standing upright on it's back legs. One of bunny's ears is flopped over it's eye. Bunny has a molded face and features. Measures 13/16" tall, 7/16" long, 9/16" wide. FPT7409 - Precious Places® pink baby bunny figure that is lying down with it's legs are under its body. Bunny has a molded face and features. Measures 7/16" tall, 13/16" long, 7/16" wide. 2 each - FPT7410 - Pink carrot bundle with molded leafy tops. The bundle has 6 carrots molded together. Measures 1" long, 3/8" wide, 1/4" deep. FPT7411 - White rounded tree trunk that is open on 2 ends and has an arch-shaped entrance on the front. The log has printed pink flowers on the sides and a round molded limb knot on the top. One side of the arched entrance has a tiny hole to place a bundle of flowers. Marked "©1989 FISHER-PRICE, DIVISION OF THE QUAKER OATS CO, MADE IN MACAO" on the inside. Measures 2-1/8" long, 1-3/4" tall, 1-5/8" wide. FPT16856 - Light purple soft plastic flower bundle with a long stem that fits into the hole in the gazebo wall pot holder. The flower bundle has 3 five-pedal flowers, each with a long stem. Measures 7/8" long, 1" wide, 1" deep. FPT7412 - Pink magnetic key with a magnet on one end and a handle on the other end. The handle is marked "Precious Places®" on one side and has an oval-shaped paper on the other side (Litho may be missing). The litho has an oval yellow background with an orangish-yellow bunny in the center with multi-colored flowers and butterflies. Marked "©'88 F-P MACAO". Measures 5-1/2" long, 1-5/8" wide, 1/4" thick. FP5243BOX1990 (Box ONLY) - Sold in a 5-1/2" long, 5-1/2" high, 2" deep box.